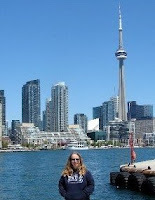 This evening Gord and I saw The Container, which is part of the 2014 SummerWorks Festival. This 60 minute play told the story of five refugees who paid a lot of money to get passage to London, England, in a shipping container ... we meet them when they are in Italy. 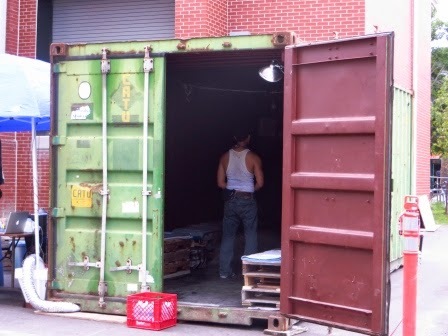 It was conducted in an actual 20-foot shipping container, which is in our 'hood. 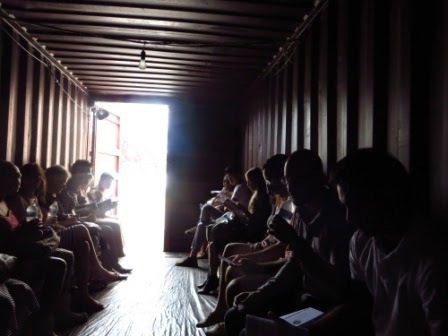 There were twenty of us in the container (it was sold out), plus the six actors. Once the play started, the doors were closed. We were warned before we went in that it was warm and dark ... not a good place to be if you are claustrophobic. We were given a bottle of water and told to hold our hand up and say "pause" if it got to be too much and we'd be let out ... no one did. The actors were excellent and performed really well ... I felt like I was actually with them, eavesdropping on their situation. Mother and daughter, Fatima and Asha, had been in a refugee camp for a few years and were heading to London to hook up with Fatima's son. Jemal's fiancee and baby were in London and he wanted to get back to them. Ahmad was a businessman. Mariam's husband had been killed and she was escaping so it wouldn't happen to her. The Agent was a slimy dog trying to weasel more money from them. 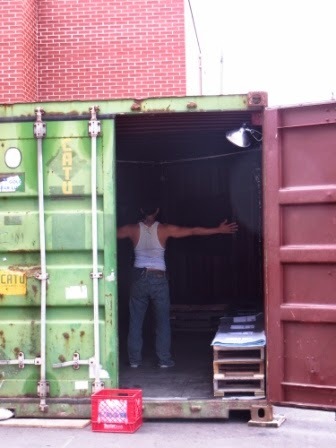 Actually being in the container increased the intensity ... it was very warm and stifling and full of tension, desperation and hope. The sound effects of a truck driving make it all that more real. This is definitely a must-see play! That is a really neat idea. I would totally go see something like that.